Would you be satisfied with the standard appliance package? Some homebuilders really have pretty decent standard appliances, and you might be perfectly satisfied with the standard package. On the other hand, you may be totally turned off by the standard appliances, and absolutely love the upgrades that the builder offers. In that case, you’re going to want to pay the difference and upgrade. Selling those standard appliances on you own for anywhere close to their full retail price is a pipe dream. Removing the standard appliances from your house must be done AFTER closing, and at your expense. Now, what are you going to do with brand new, but unboxed standard builder model appliances? Purchasing new appliances and getting them installed after you home closes, and your standard appliances have been removed is another nightmare, especially while you’re now in the middle of moving into a new home, and have no appliances. 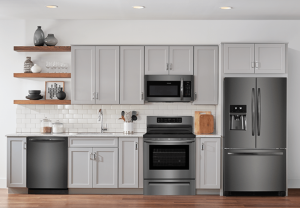 The truth is this: If you want upgraded appliances, and your builder has an upgrade offer, you are nearly always better off purchasing the upgraded appliances through the builder. There are other reasons you might want to have the home builder provide your new appliances. You’ll have no worries with delivery, installation, damage, or scratches on your new appliances. Your new appliances are installed and ready to use from the day you take possession of your new home. It’s always a hassle moving into a new house, so it’s nice not to have to worry about cooking your first meal when you move in. In conclusion, our opinion is that builder upgrades on your new house are usually going to be your best bet. As always, discuss your options with your Arizona Wholesale builder appliance consultant for your best appliance choices.